On September 7, 2018 the Jordan Center hosted Podlich Family Professor of Government at Claremont McKenna College Hilary Appel and chair of the Russian Studies and Eastern European Studies at University of Pennsylvania Mitchell A. Orenstein for a talk on their book “From Triumph to Crisis: Neoliberal Economic Reform in Postcommunist Countries”. The talk was introduced by NYU Assistant Professor of Politics Arturas Rozenas. The book was originally published in March 2018. 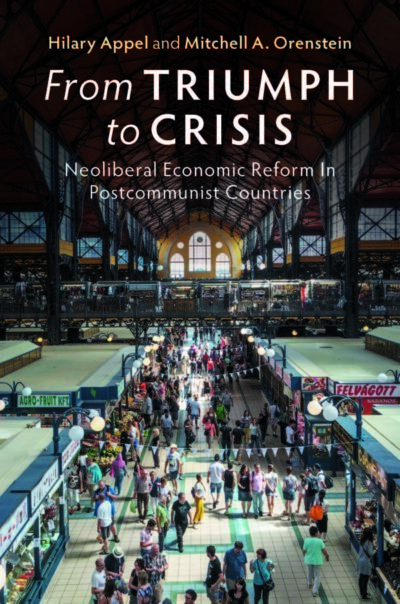 Both authors spent time in Eastern Europe during the 1990s, where they observed the post-communist countries’ attempts at integrating their economies into the global market and embracing neoliberal economic reforms. The book examines how the neoliberal model actively persisted for over a decade after the Soviet-collapse until the global financial crisis of 2008. Following the Soviet collapse, several theorists predicted that the neoliberal reforms would have a very short run due to the difficulty in implementing them, and that the politicians spearheading the reforms would be swiftly voted out. The reality however, was quite different, as neoliberalism triumphed for almost twenty years – an outcome that the book attempts to explain. Even when the left – and in certain countries the far right – came to power, the reforms continued to be implemented. It’s “as if they were scared to death to diverge from this model when they finally made it to office,” Appel explained. Appel referenced how after Yegor Gaidar – the chief architect of Russia’s shock therapy – failed to secure a seat in government for a second time, his successors Viktor Chernomyrdin and Herman Gref continued to implement neoliberal reforms. The book argues that academics should be responsible for providing explanations as to why prior theories were not born out by empirical results, while proposing a new transition theory and also explaining why neoliberalism gave way to populism after 2008. The book argues that scholars were too focused on domestic environments, rather than observing how the post-communist countries would benefit from interacting with a global environment. Immediately following the collapse, the post-communist countries were in desperate need of capital. According to records obtained by Appel and Orenstein, the IMF and EBRD sent out a very clear message to the countries: ““you need to attract foreign direct investment and capital as a path to economic growth and development”. The availability of declassified conversations between the IMF and post-communist governments now fully deprives academics “of the need to guess what was discussed,” Appel explained. The EBRD, Appel added, was actually founded for the very purpose of attracting foreign capital into these nations. The countries quickly understood the message that a broad range of neoliberal policies were needed to be implemented, and saw the correlation between the ability to attract foreign investment and liberal institutional reform. Meanwhile, the EBRD schematized all the economic transition indicators, both for scholars and for potential foreign investors. The indicators demonstrated that all the reforms implemented by the governments were strictly neoliberal, and they served as an excellent index for potential foreign investors. The post-communist countries attracted foreign investors primarily through competitive signaling. Two of the major factors that played a role in influencing the post-communist countries to liberalize their economies were the Washington Consensus and pressure from the EU. The EU was particularly rigorous in seeing through neoliberal reforms, forcing countries that sought integration to privatize steel, liberalize land markets, and lower tariffs. “If you fall behind, you’ll be left out of the first wave of enlargement” was the looming threat from the European Union. Certain countries even went beyond the demands of the EU and the Washington Consensus, introducing reforms of their own such as pension privatization, flat taxes and slashing corporate tax incomes. These attempts at employing “avante garde liberalism” sent an even brighter signal to foreign investors. The correlation between enormous flows of capital and FDI with neoliberal policies gave post-communist “leaders good reason to believe” that the signals their countries were sending were in fact working. Vladimir Putin, for example, set a goal for Russia’s “Ease of doing business index” to jump from 120th place in the to 20th place by 2018. Although the country managed to only reach 35th place, the large strides taken serve as visible evidence for progress. The neoliberal trend abruptly hit a dead-end during the global economic crisis of 2008, in effect breaking the competitive signaling process. As soon as the money stopped flowing in, growth began to decrease.The sudden disappearance of a consistent flow of money prompted policy makers to look toward alternative models, many of which included nationalizing their economies. Orenstein pointed out that one of the key debates happened within the EBRD itself, who initially argued that globalization and neoliberal reforms were positive for the countries, but eventually admitted that the free-flowing capital “enabled the bubble”. “If it hadn’t flown in to the extent it did, it wouldn’t have flown out to the extent it did,” Orenstein added. Interestingly,the EBRD no longer reports transition indicators. The global financial crisis of 2008 marked the downfall of a neoliberal policy in post-communist countries. “Several perceptual changes of the signalers, the signalled and the communication medium, effectively brought the whole system into crisis,” Orenstein said. This eventually gave rise to populace-driven governments. Viktor Orban’s triumph in Hungary serves as the primary example for this: a policy that is characterized by a nationalist vision of a domestic capitalist class that diverts from the mainstream. Among the many actions undertaken by the new models included a confiscation of private property, and more attention to welfare policies. Rather than looking to the West, these post-communist governments are increasingly looking towards China as a new example. In the Q&A session following the talk, the speakers commented on the present state of these post-communist economies. Despite the nations’ departures from neoliberal economic model and transitions into more nationalized models, foreign investments continue to flow in consistent quantities. This, according to Orenstein, demonstrates that the signals were wrong at some level, and the EBRD was wrong in convincing these countries that a neoliberal model was the only sound option.